The HEAL Cities Campaign, a partnership between OPHI and Kaiser Permanente, which helps civic leaders create healthy communities by adopting and implementing healthy eating and active policies and programs. The BUILD (Bold, Upstream, Integrated, Local and Data-driven) health challenge, funded by the de Beaumont Foundation, brings OPHI together with broad partners to bolster access to holistic, culturally and linguistically responsive health services in a local Portland neighborhood. The Oregon Health & Outdoors Initiative, a multi-sector partnership which increases access to parks, nature, and the outdoors among vulnerable communities. 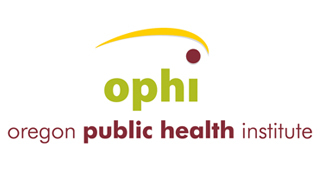 OPHI's mission: Improve the health of Oregonians. OPHI's has a vision for "tomorrow’s health, today." OPHI is building a future Oregon where the places we live, work, learn and play support a vibrant community of healthy people. OPHI is guided by an abiding belief in the long term value of preventive health for everyone and we actively partner with others to achieve that vision. Get in touch with the Oregon Public Health Institute. Tatiana Lin (Kansas Health Institute) and speakers from Georgia Health Policy Center, and the Oregon Public Health Institute discuss experiences in conducting effective HIA trainings in their regions. See Oregon Public Health Institute’s organizational milestones from its founding in 1998 to 2012 and its support to enact the strongest state chain restaurant menu labeling law in the US.